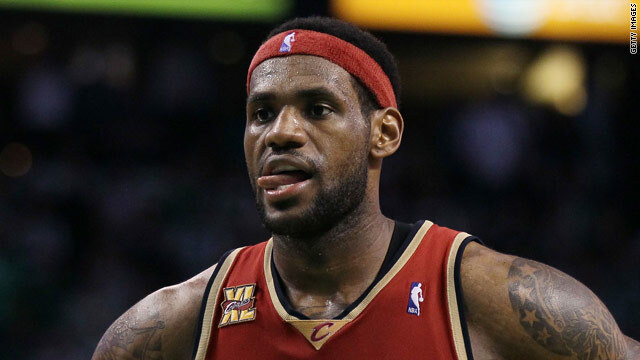 LeBron James has left Cleveland Cavaliers to join the Miami Heat in a blockbuster free agent deal. The news that Lebron James is to become a Miami Heat player may or may not have caught your attention, depending on your interest or lack thereof in the NBA, but the sheer scale of the hype that surrounded the lead-up to his protracted revelation would surely have turned your head. I know it did mine. In fact, the “Lebronathon” was even heavier on hype than David Beckham’s “inauguration” as a Los Angeles Galaxy player, and came close to the Obama-mania of the last U.S election back in 2008, boasting a live announcement on national television, billed as “The Decision”, that was sandwiched between a tsunami of pre and post speech analysis from sea to shining sea. You’d have thought King James was a real king. Let me say for the record that I acknowledge that Lebron is an extremely gifted basketball player. And, according to expert opinion, may one day surpass Michael Jordan as the best of all time. But that day has not arrived yet. In fact, though he’s a 2-time League MVP it could be argued that he’s not even the greatest player currently in the NBA, as Kobe Bryant is at least as influential for the Los Angeles Lakers and he has 5 Championship rings while Lebron has none. Granted, King James is six-years younger than Kobe, but by Lebron’s age of 25 Bryant was already a 3-time NBA champion -– a feat he’d managed by the age of 23! What’s more, unlike Michael Jordan, Kobe’s predecessor as the face of the NBA, Lebron had yet to transcend his sport in any obvious way prior to this week’s made-for-TV reality show, especially on a worldwide scale. Jordan was known globally as a cultural icon to millions who’d never seen him play. Lebron, at present, just plays great ball. End of story. Indeed, during a discussion I had in London recently, the consensus of opinion was that Lebron could walk down most British high streets and go largely unnoticed except for his height. While a colleague of mine in CNN’s Hong Kong bureau felt he was similarly unknown there. Certainly, those are unscientific assumptions, and perhaps in some places, such as Greece and Spain, where basketball has a lot higher profile, King James would not be so anonymous. But neither, I suspect, would he be universally regarded as a household name like say, Cristiano Ronaldo or Usain Bolt. Of course, the NBA would beg to differ, as it lays claim to being a globally important league in a globally supported sport, with Lebron as its jewel in the crown. However, despite the fact that NBA teams and players can attract a crowd when they travel overseas, I suspect that much of that attention is down to novelty value and the fascination by some with all things American. In other words, they’re not necessarily dedicated followers of the NBA. Certainly, it appears that interest in the league is growing worldwide, but the idea put forward by one American analyst that Lebron’s decision would, “shake up the world” was massive overstatement. He was choosing a club not revealing the secret to world peace! That didn’t stop the “Countdown to Lebron” dominating the day in the U.S though. Neither would anyone concede that maybe the rest of the world was not on the edge of its seat awaiting the announcement. But then, as the PR machine decided when his free agency was first discussed more than a year ago, this was the “Summer of Lebron”, and the world was going to hear about it whether it wanted to or not. Which camp were you in? I think that it is so sad that with all the problems our country is having that some of us spend all this time and energy on a man who is playing a game and makes more money than teachers, social workers and law enforcement will ever make. These are the people we should be cheering and paying! Hats off to LeBron and viva Miami. You have to know when to fold em, and he did. Cleveland cound not put together a winning team in spite if having the best player in the universe... OF COURSE he wants a championship, every athlete does! And as for his rock star celebrity, blow it out of your ears sports guy. It is the media that makes sports fighures into rock stars and then when they start to act like rock stars your are confused...it like when Dr. Frankenstein created a monster, and was shocked when his creation started acting like a monster. Dr. Media Frankenstein....behold your creation! You may think that the interest about Lebron's decision was strictly a U.S. affair. Fine. The English like to say that "what "great" men do the least will prattle about. This column is , apparently, part of the "prattle. What a joke... it just keeps getting worse and worse.. such a humble man ..
Good analysis. I'm in the "Summer of the World Cup" camp – the rest of the world (billions of people!) is more concerned about the World Cup final. As you state, James might get noticed around the world for his height but very few would recognize him for his status in the NBA (well maybe a few in China would!). I couldn't agree more. As an American and a sports fan - but not an NBA fan - I was paying attention to LeBronathon more for the implications of loyalty. I come from a small market with its own teams, similar to Cleveland, and each defection of a big star to the bright lights of a big city team is one more nail in the coffin of small-market teams such as my own. Burning jerseys aside, the people of Cleveland should have a real beef with LeBron leaving, not because he actually left, but because he strung them along for so long, only to humiliate them on national television last night. Cleveland - and all small markets - deserves better. The fact he was from Akron, so close to Cleveland, makes it even harder to bear, because he should have grown up with the same small-market feelings instilled in him. Again, going to the big city, or chasing money (which he didn't do, actually), is not the problem; betraying his hometown in the way he did is. Imagine if Lebron was playing with a guy better than him who would have won the NBA Finals MVP like Kobe had, than I'd think Lebron would have won a few by now himself. I think that even Kobe Bryant could be/is a greater global basketball star/icon than LeBron. I'm not sure if the Nike:Write the Future campaign that they recently did for the World Cup was shown all over the world or only in the US (I'm betting it was global) in the commercial, they show Kobe Bryant, NOT LeBron James (another Nike guy) mimicking Ronaldhino. Now, I understand Kobe may be a bigger soccer fan than LeBron; however, if LeBron is the face of the NBA for the global market, why not have him in the commercial? LeBron simply is not a global icon and does not receive global attention...yet. If I hear this man name one more time, I will scream.....enough already. As far as I'm concern Lebron James' name is MUD. He talked about Michael Jordan....that was the wrong thing to do. Michael is BASKETBALL. True, Lebron hasn't really proven anything yet. For someone like me who doesn't follow the NBA on a daily basis, it sounds like Chris Bosh or Amarie Stodumire would have similar impacts to the teams they went too. Now Lebron is with two other superstars and I'm sure Miami will win the crown someday, but it will be hard to prove that Lebron was the main character in that. No one outside the US gives a damn about LeBron James..It is not a story outside the US. It doesn't matter if he had stayed at Cleveland, gone to Chicago or to Miami..He is not a global superstar like Beckham, Ronaldo or even Bolt. In the world stage he is nobody. If Kobe Bryant was in the position of LeBron, the situation might have been different because Bryant is the real successor of Jordan. What a waste of perfectly good air time. Is Lebron on the payroll of the worldwide leader in sports, or are they on his? This was a disgrace. No perspective. No objectivity. Nothing but sycophancy. Incredibly bad TV. And as for Victoria and Steve Skeete who dogged the writer for his observations, don't shoot the messenger, especially when the observations were spot on. This was either the biggest act of hubris and self-importance in the history of sport, or the PR stunt of a lifetime. Either way, Lebron's relevance as anything but a basketball player was way over-stated, and the fact that TV and some of his fawning fans choose to see his "decision" as the second coming was just plain ridiculous. people care about him. And where is the doping control in this sport? Most of the players have taken some kind of illegal drugs. open mindness on a global scale, you are forgetting that the NBA is a global game if lebron was to come to london. which i sincerely hope he does i know he would be recognized, as a nba ambassdor and a great player. As a superstar i want to emphasis something very clearly although most of the world is focused on the world cup, the manner in which the french went out, england s dismal performance and the brazilians. it is quite easy to see that "team unity" was not evident with some national teams. In all american sports unity is taught and it comes naturally, heart, determination, and confindence, of which both lebron and kobe they seem to have this qualitiy in abundance as do all superstars in their given sport. Lebron may be the U S hero but for outsider like us he haven`t achieved anything yet .Jordan is global icon for what he inspires millions to pick up basketball.may be we can judge him after 5 to ten years from now .only 10%of people nows about him outside US. In the 1990's, the NBA was way more popular around the world than it is today, thanks to MICHAEL JORDAN, the best player of all time. I remember that in France for example, basketball had even become more popular than soccer for a little while. Jordan was indeed an icon, not only a great basketball player, or should I say an alien playing basketball, but also a cultural figure, even old ladies knew who he was, and he'd not be able to walk down the streets peacefully (I'm not even sure he'd be able to do it nowadays). Jordan was the best athlete in the world, and by far the most famous one... Lebron James is a great player but he doesn't have Jordan's aura. WIN CHAMPIONSHIPS like MICHAEL JORDAN. What is the point of this article? At the end of the day, this looks like someone having another go at "American" sports. As the World Cup clearly demonstrates, there is only sport that can truly captivate the world. That said, the "American" sports of basketball and baseball are becoming more popular in many parts of the world both in terms of fan base and participation. Who can say why that is true. I can only hope that trying to knock basketball isn't yet another attempt to make the case for the worldwide appeal of rugby and cricket. Basektball and baseball compred to rugby and cricket in popularity at the country level? Please. “to be all he could be”. He’s a Stand up Guy that’s fulfilling the American Dream. We are Proud as Ohio Buckeyes, Clevelanders and Akaraeanas to have raised another World Class Winner with more to come. A respected individual, of well deserved stature, acknowledged as a King in his field. LeBron James, long live the King. I disagree with those who think that Kobe would be a more recognisable face of basketball than Lebron. I contend that they would be both as anonymous as each other outside of the USA. Dwyane Wade's gonna have one more ring than him? to me "King" James is really Pretender James the Quitter. Yes indeed, this event is an strictly USA affair as the wrongly named world series of the MLB or the superbowl ("most watched event af all"... ) or even the most popular but still not really global NBA final series. Good article, good point. A bit of humility is good from an american media writer. I'm British and a big fan of all sports in general. I know who LeBron James is, I've been to the US and seen a few NBA games, but honestly, if I saw him walking down the street in London – I probably wouldn't recognise him. LeBron doesn't have that instant face recognition of someone like Kobe Bryant. And its certainly not even close to the type of global fame that soccer stars like Rooney, Messi and Ronaldo have. The Decision: Lebron James is not hyped as a king worldwide, unlike in the USA that he is King James of the NBA. In the first place, I am awestruck by the basketball talent God has bestowed to Lebron – but this fascination went almost kaput with his show of unsportsmanship and boastful gestures – and the notion to be the first athlete to become a billionaire. Even if this comes to fruition – most of us normal people wouldn't mind. Who cares. The guy left his team to go play with another team. How many times does that happen in sports? Only in America does this warrant front page news. Outside your borders, its a small paragraph on the back page! Get over yourself America! LeBron is getting paid for the work he is doing and can do and will do, it's a known fact that "one man does not a team make", if a team cannot find the right peices to surround him with it's the teams fault. The guy plays smart, plays tough and plays with heart, he is always in shape, gets betterevery year and stays out of trouble. Naaaaaaaaaaaaa!!!!! !, pay the man because he will deliver all the time, but he can't win by himself. It's true that the Lebron spectacle was mainly a U.S. affair. I'm Asian and while I follow various sports, including basketball, I didn't really care about the Lebron tug-of-war (except to find out after where he was going). After the NBA finals, my mind was focused on Wimbledon and the World Cup. To my disappointment, American writers and bloggers would sneak the Lebron show in articles about tennis and football like it was the most important thing going on in sports – it wasn't, of course. Waaaahhh - so he's paid more than teachers and law enforcement types. Civil servants are rarely heros. In fact, many of them are incredibly lazy, unionized, self-entitled cry-babies. In a put-up-or-shut-up world, I have very little patience for those who do neither. When teachers stop opposing real accountability and testing against standards, thats when they'll be heros in my mind. But as long as our schools languish behind the rest of the free world's and the teaching unions desperately try to protect that status quo - no. No, we should not celebrate them with news coverage. Excellence is what should govern acclaim.